Home » Defence & Security » Trump and the threat to withdraw from the 1987 INF treaty. Trump and the threat to withdraw from the 1987 INF treaty. The announcement that Trump might pull out of the 1987 Intermediate-Range Nuclear Forces (INF) Treaty is, on the face of things, a worrying development. It suggests that a new “arms race “is about to start-up in what some regard as being a return to the bad-old-days of the Cold war. However, as is so often the case, the surface gloss and spin provided courtesy of the high-street press is not necessarily the whole story and it is worth looking behind the façade to see what this is really all about. 1987 was an interesting date. Mr Gorbachev had been in power for long enough to know that the Soviet Union was not in a position to match the economic strength of the US and that his own county was in an increasingly precarious state, be it socially, politically, or financially. In East Berlin you could buy a dictionary of wealthy old families; railway sets in the livery of the royal Prussian railways; ceramic tiles with images of Princess Frederica of Prussia. Leaders in Eastern Bloc countries knew things were “going down the tubes” and were trying to re-establish their own national identity – royalty and all. That is not to say the US had things all their own way. In spite of growing pressure to divert money back to the civilian economy, Soviet weapons had advanced a lot in the late 1970s and missiles like the SS-20 presented a real problem to the West. They were very mobile, hard to spot, accurate, and able to deliver a nuclear warhead to a range between 600 and 5,000km. Above all, they had a solid-fuel engine that could be fired-up very quickly, unlike liquid-fuelled rockets that might take many hours to prepare. The SS-20 TEL. Highly mobile and able to launch a missile at short notice due to using solid fuel engines. Some in the West believed the SS-20 marked a new phase in Soviet strategy, providing them with the ability to use a mass of smaller, nuclear weapons that could avoid immediate escalation to an all-out nuclear war. Others suggested it was an inevitable outcome of the Strategic Arms Limitation Talks (SALT) talks (which led to the Strategic Arms Reduction Treaties (STARTs), which are technically still in force today). Agreeing to limit the development of long-range weapons controlled by SALT, the Soviets simply dialled down the range and kept going. At a tactical level, some thought the Soviets were worried that the West would try to deploy large numbers of tactical nukes response to the overwhelming superiority of their forces over NATO’s defences. Others, more aware of the internal power struggles ever-present in the USSR, realised it was possibly indicative of a shift in power away from the military to a new generation of industrial interests looking for new equipment orders to maintain their power and production facilities. Growing concern amongst West European leaders by the end of the 1970s led to requests that the Soviets be challenged to reduce their tactical nuclear weapons holdings in response to a removal of US systems as well as a threat to deploy the Pershing IIs and Cruise Missiles mentioned above. Talks started in 1981, but after prolonged haggling over numbers and who had what (including whether the UK and French-based US missiles counted etc. ), the US started to deploy Pershing II in 1983. The Soviets walked out – as they had said they would. It was all part of a series of events in a year that many now regard as one of the most “dangerous” of the Cold War, in which a NATO exercise and a false-alert in a Soviet automated warning system almost led to war. However, by 1986, and after intervention from the UK, the US and USSR were once again talking – and the haggling started afresh. In late 1986, West Germany conceded that reductions in Western intermediate nuclear weapons was the key and agreed to the unilateral removal of US-German Pershing 1 missiles. The US and USSR then agreed a text and the bi-lateral US-USSR Intermediate-Range Nuclear Forces Treaty was signed on 8th December 1987. A number of subsequent or subsidiary agreements followed including the Conventional Armed Forces in Europe signed in November 1990, and the Arms Control and Disarmament (Inspections) Act in 1991. There were once again a series of follow-on sub-agreements or side-bar treaties, not all of which were ratified by the former Soviet countries, for by this time the Warsaw pact was, of course, breaking up and not everyone saw a need to be tarred with the Soviet brush. A Soviet inspector examines a BGM-109G ground-launched cruise missile in 1988 prior to its destruction. Image: US DoD. From 1987 to 2001 things went relatively smoothly – on the surface at least. Thousands of missiles were destroyed or removed from Europe, with inspectors on both sides taking the opportunity to visit the other side of the Iron Curtain (and to do a bit of snooping amongst other things). However, by 2001 the US wanted to develop a new form of missile defence that was assumed to violate the agreement. So they notified the Russians of their intent to withdraw – the first formal attempt to do so by either party. In 2007, the Russians also decided to give notice of withdrawal – based upon the continued threat proposed by the forward basing of US defensive missiles in east European countries, considered to effectively be in Russia’s backyard. The following year, 2008, saw a US protest at the testing of a new Russian cruise missile, the SSC-8 with a range of 3000km. The SSC-8 was again the subject of 2014 and 2017 US-protests after being deployed in small numbers. The testing of other new Russian missiles systems, including the road-mobile. 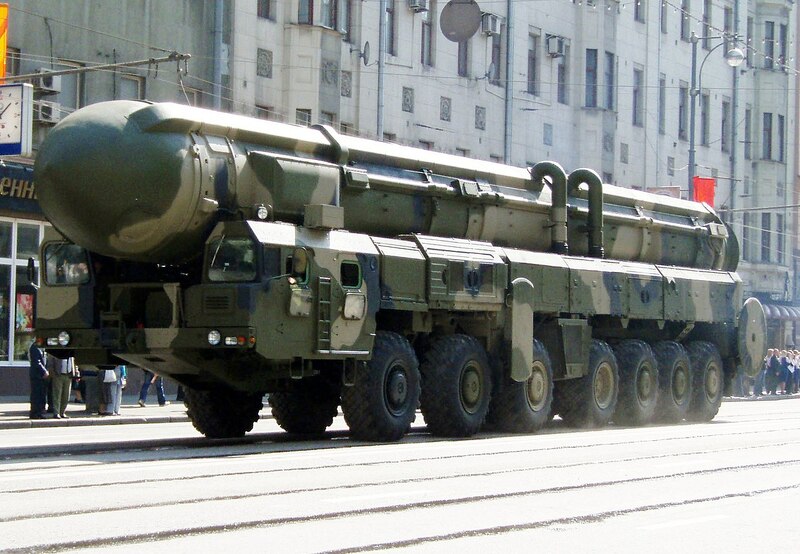 hypervelocity SS-25 (Topol), sparked further US protests from 2013 onwards. Victory Day Anniversary Parade dress-rehearsal, Tverskaya Street, Moscow, Russia, May 5, 2008., MBR Topol, or SS-25, hyper-velocity missile system. For their part, the Russians started to protest about the deployment of ground-launched cruise missiles in Poland and Romania, citing (not unreasonably), the original bi-lateral agreement which sought to remove the GLCMs back in the early 1980s. To make matters more complex, the Russians also dragged UAVs into the argument, citing the large-scale use of the Reaper UAV as an example of American attempts to side-step the treaty in intermediate nuclear weapons. However, what neither side had explicitly admitted was that, over the years, both had growing concerns about China – which refused to be drawn into, or bound by, what was essentially a bi-lateral treaty between the US and Russian over weapons in Europe. The US was watching the imbalance of power growing in the Pacific, with China heading for some sort of territorial dispute which it, China, would almost certainly win unless the US could develop and deploy theatre/tactical weapons proscribed by their agreement with Russia. The Russians have adopted a different approach. Post-1991, they identified themselves as fellow-sufferers of long-term US political, industrial and military dominance in the world; both believed that “their time” is now coming, with some suggesting that they will be the equals of the US in military power within about ten years. With this in mind, Russia sold military equipment (such as ships) and oil to the Chinese- though not nuclear technology as far as TMT is aware. But, the question has to be asked about the point at which Russia will once again view a resurgent China as a potential threat. And so, although they are today carrying out joint (but limited on the part of China), exercises where previously they had been skirmishing along the border, the potential for conflict could be building. The UK has joined the Europeans, expressing concern about the Russian missile developments, but also saying that the Trump declaration would leave Europe vulnerable to a new arms race. This last point is particularly concerning as there seems to be little likelihood of any modern European state welcoming a return to the 1980s, with large numbers of US weapons stationed on their territory and likely to become the target of Russian pre-emptive strikes in the event of a future conflict. The same sentiments are being expressed by Pacific states, no matter how friendly they are to the US. Their view is that their presence might make the Chinese more likely to use military force – not less. Moreover, Trump’s attempts to de-nuclearise North Korea would be made to look rather hypocritical if he were to try to impose the stationing of hundreds of nuclear weapons around the Pacific. It seems certain that China, the only country with any real leverage to affect North Korea, would cease all attempts to bring their young leader to heel. It is not too hard to understand why the US regards the threat to withdraw from the 1987 agreement as a logical step after years of perceived Russian wilful non-compliance. However, the world is now far more complex than it was in the Cold War and it is probably fair to say that not even the most expert commentators have any idea of how this is all going to play out. Comments on Trump and the threat to withdraw from the 1987 INF treaty. There is 1 comment on Trump and the threat to withdraw from the 1987 INF treaty. Donald “Duck” Trump has acted like a cartoon character. He is immune to the consequences of his actions driven by his ego which is driven by his internal mental issue of his fright of been a failure. Any sane person would have pumped Billions into new replacements for Pershing 2 missiles quietly BUT the ego takes over, the need for praise. Sigmund Freud would have had a field day with DD Trump.